This article originally appeared on Front Page Magazine and was reposted with permission. 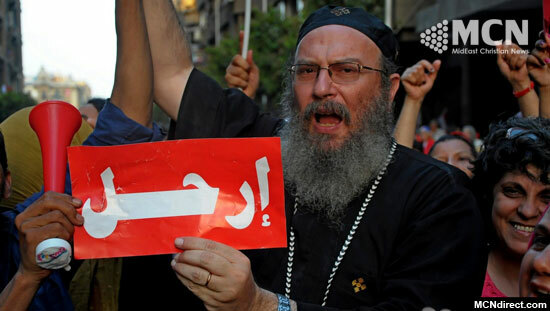 Copts participate in Egypt’s anti-Muslim Brotherhood demonstrations. Our friends at MidEast Christian News report on the current situation for Christians in the Middle East. Especially now, when once again the Copts and other Christians of Egypt have thrown in their lot with all the other Egyptians who demanded the overthrow of the Muslim Brotherhood and of President Morsi, they have a right to expect to be treated equally in their own country. There have been alarming signs that this is not the way the new government of Egypt is thinking of heading — to put it mildly — with Christians being killed and word of a “way forward” in Egypt that seems as dependent on Sharia, if not more so, than the Morsi government. Pastor Ekram Lamie, head of Egypt’s Evangelical Synod, said that while the church is not involved in politics, it does support Copts exercising their full rights by participating in political life. He added that Copts should act to achieve justice, dignity and progress for the country. Lamie added that the Evangelical Church supports the Egyptian people in building a democratic state that would respect their differences and protect their rights and freedoms. He added that the church works to spread tolerance and peace between the different factions of the Egyptian people. Lamie also said in a statement that Egypt witnessed a critical phase during the June 30 Revolution which restored the Egyptian identity and corrected the path of the January 25 Revolution. He added that the Evangelical Synod supports the Egyptian people during this critical period which will pave the way for building a democratic state that respects differences and diversity and protects rights and freedoms. Lamie called on the Evangelical churches to adopt social and national reconciliation initiatives to spread the spirit of peace and tolerance among the different factions of the Egyptian community. He also called on churches, their institutions and individuals to support Egypt’s economy. Lamie urged all citizens to work to achieve development on economic, cultural and scientific levels. He called on the different parties to renounce violence, adding that he prays to God to protect the country. It is important to mention that Egypt has experienced sporadic violence since the removal of Egypt’s former President Mohamed Morsi. 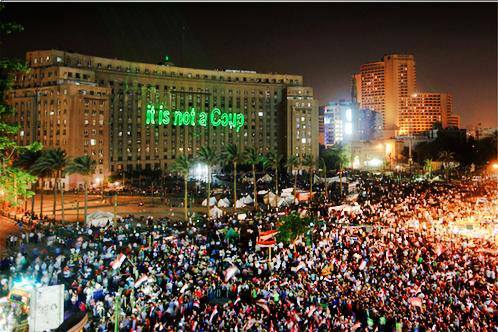 Moreover, islamists organized large demonstrations to return Morsi to the power. The Copts also faced a significant number of attacks because of their participation in June 30 demonstrations. In a July 11 post here on Juicy Ecumenism and in Front Page Magazine, Ryan Mauro announced that the Clarion Project has launched a petition to designate the Nigerian jihadist killers Boko Haram as a Foreign Terrorist Organization (FTO). 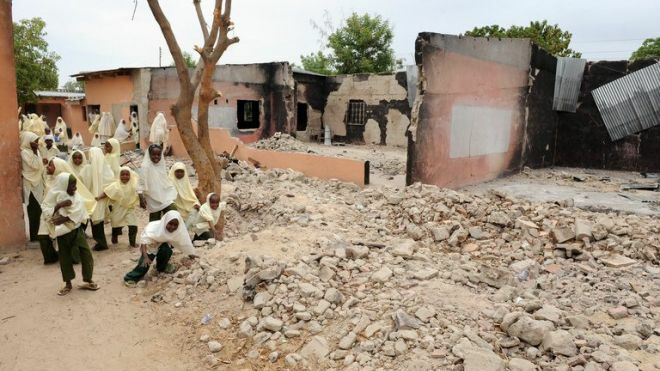 The northern Nigerian group dedicated to eradicating the Christian presence in northern Nigeria and imposing Sharia in the entire country, has been responsible for the slaughter of thousands of Christians. Shocking, indeed. But even more shocking is the State Department’s attitude towards Boko Haram as revealed in the Congressional testimony of former Asst. Secretary of State for Africa, Johnnie Carson. In addition, the State Department’s human rights and religious freedom reports go so far as to scold Christian leaders for speaking the truth about the Islamic jihad against northern Nigeria’s Christians by Boko Haram. Please take the time to sign this petition. We need to let the Obama Administration that we will not sit idly by while Islamic jihadists kills off northern Nigeria’s Christian population week after week. There is no ambivalence in the press statement released by the Most Rev. Dr. Mouneer Hanna Anis, the Bishop of The Episcopal/Anglican Diocese of Egypt with North Africa and the Horn of Africa and President Bishop of The Episcopal/Anglican Province of Jerusalem and the Middle East. “At last, Egypt is now free from the oppressive rule of the Muslim Brotherhood!” he writes in Mabruk ya Misr (Congratulations, Egypt!) on July 3, 2013. Bishop Anis does not see recent events — the overthrow and removal of office of Muslim Brotherhood President Mohamed Morsi — as a military coup. “The Armed Forces took the side of the millions of Egyptians who demonstrated in the streets since the 30th of June against President Mursi and the Muslim Brotherhood,” he says. “The Armed Forces responded to the invitation of the people to intervene and force the President to step down at the request of the people of Egypt,” he continues. Anis and the 30 million Egyptians who marched against the Muslim Brotherhood last week see the result as a People’s Revolution, created by the people of Egypt — Christian and Muslim alike. Wrong! exclaims Phares. What is really happening, he explains, is that “the international Islamist lobby plus the business network of the Ikhwan, which has already mobilized CNN and the New York Times to blast the Egyptian people and army, is trying to fool the public and unfortunately uninformed journalists and bloggers.” In reality the Egyptian people love the people of America. They are shocked by President Obama’s support for the Muslim Brotherhood, but they do not hold the people of our nation responsible. Rather than listen to the propaganda spewed by the Muslim Brotherhood and their Islamist friends, and, unfortunately, most of the media, seek out the reports and comments of people like Bishop Anis, as well as the leadership of the Coptic Church — who speak for the Christians and other minority faith groups. Listen to the continuing coverage and commentary by Dr. Phares, beginning with the links to articles at the end of this blog post. And listen to others who are recording the history of the fight for freedom and democracy in Egypt, such as Egyptian political activist and writer, Cynthia Farahat. On her website, Farahat has shared an interview with an unbelievably articulate and intelligent twelve-year-old Egyptian boy, explaining why he has been protesting against the Muslim Brotherhood in Tahrir Square. There is also good information from Voice of the Copts and MidEast Christian News. “As soon as Field Marshall Abdel Fattah el-Sisi announced this, millions of Egyptians on the streets went around rejoicing, singing, dancing, and making a lot of fireworks,” said Bishop Anis. “I have never seen Egyptians rejoicing in such a way! They deserve this joy as they insisted to write their own history!” he declared. The only solemn note in the bishop’s statement was to ask for prayer for the healing of the divisions in Egypt that had taken place with the ascendency of the Muslim Brotherhood, and for protection against violent backlash from the supporters of Islamic supremacism. It is the eve of Independence Day in the Republic of South Sudan. Tomorrow, July 9, will mark the nation’s second birthday. To prepare for this solemn and joyful occasion, the Most Reverend Daniel Deng Bul, Archbishop of Sudan and South Sudan (Episcopal Church of Sudan) has called the whole country to prayer. All over South Sudan there will be city and community-wide prayer services, including in Juba Stadium in South Sudan’s capital city. The archbishop is chairman of the committee, with Catholic Bishop Emeritus Paride Taban as Vice-chairman. The Committee for National Reconciliation includes a number of other Christian and Muslim religious leaders, a representative of each state, and members of civil society representing women and youth. In January of 2011, Southern Sudanese from every people group came together to participate in the Referendum on Secession from the nation of Sudan. The photos included with this blog post are of some of the many Southern Sudanese living in America that participated in the referendum in Alexandria, VA in the Washington, DC area. Voting took place from January 9-15, 2011, and the results were announced on February 7. It was an overwhelming 98.83% in favor of separation from Sudan. On July 9, 2011, the two countries separated officially, and the nation we now call the Republic of South Sudan was born.